Enter your room to find a special surprise to enhance your experience in New Hampshire! 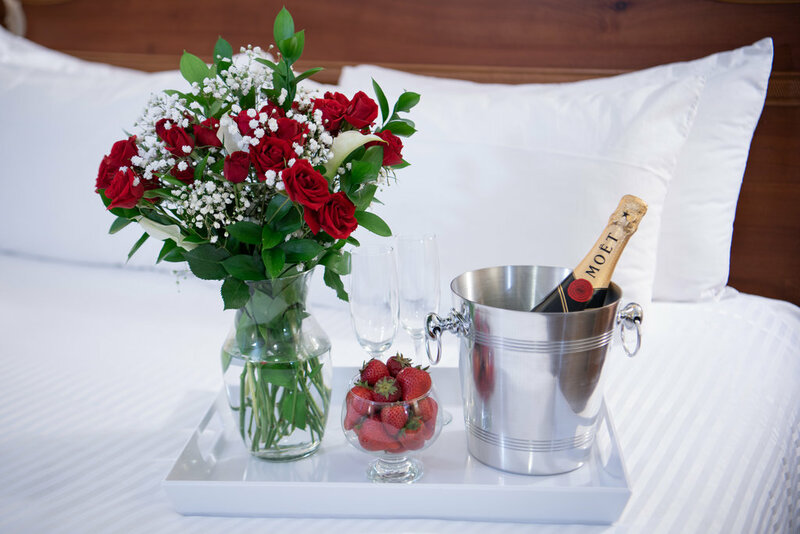 Make your experience at Port Inn Portsmouth an extra special one by adding a romantic gift to your stay. Start your vacation off with a memorable treat when you check-in. Surprise your loved ones with a personalized touch, which our staff will prepare and have waiting in your room. Select from a diverse range of romantic options like a fresh floral bouquet, chocolates, or a bottle of champagne on ice. Your partner will adore the thoughtfulness of the gesture, and you will be sure to start your stay off on the right foot! Also included in your stay will be a complimentary breakfast spread each morning, the use of a beautiful outdoor pool and sundeck, dynamic outdoor spaces with BBQ areas, and spaces to kick back, relax, and enjoy nature. Plus, take a break to get some work done in our on-site business center, where you will find a computer, Internet access, a printer, and a scanner. Simply call ahead at (603) 436-4378 to and our staff will help you customize a package that's just right for you.